Bronze 3 blade 27" x 20"
The seller reports that he believes the engines to be original 1964. He states that they start easily without glow plugs or pre heat. There average annual use would be 74 hours. He further states that there is only slight smoke on start-up which goes away during as they reach operating temperature. Though John Alden designed many motor sailer models with either sloop or ketch rigs these boats were not thought of as "sail only" vessels. The idea was to give some relief to the engine on long passages with the idea of helping to extend the range and reduce the fuel consumption. This boat is a Trawler with some sail assist. This boat was built by the renowned Hodgdon Bros. yard in wood with double planked mahogany on yellow cedar, fastened to 2” oak frames on 12” centers with bronze screws. The Alden site designates this model as an "Offshore Power Cruiser. The sail rig is intended to be an assist and not intended as a sail only source of power. John Alden specified two different designations for this model number 935 A and B. The model A for a single engine and B for twin engnes. Decks are canvas covered plywood on 2 ½” x 3” deck beams on 12” centers. The keel is a 5" timber with a bronze shoe. Hydraulic steering; bronze seacocks; bronze shaft log with packing gland. Forward from the main saloon is an expansive galley to starboard. The galley features a built-in refrigerator and freezer, electric ceramic cooktop, microwave, sink, and ample counter space and storage. The forepeak cabin features upper and lower single berths on the starboard side and to port is a counter and a washer-dryer unit. Aft and to port is a second double sleeping cabin with two upper and lower berths. Further aft and to port is a head with shower. Lecrasan MSD Type 1 waste treatment system. Rigged with Paravane stabilizers for roll reduction underway and at anchor. This vessel was owned by the Decca Corp and was used as a platform for demonstrating two different models of their auto pilots. Both systems are still installed. The canister life raft is older and may or may not be able to re-certified . Here is a vessel with provenance! Both the builder and the designer are well respected for their history of producing world-class vessels. The materials and construction methods are of the highest quality. 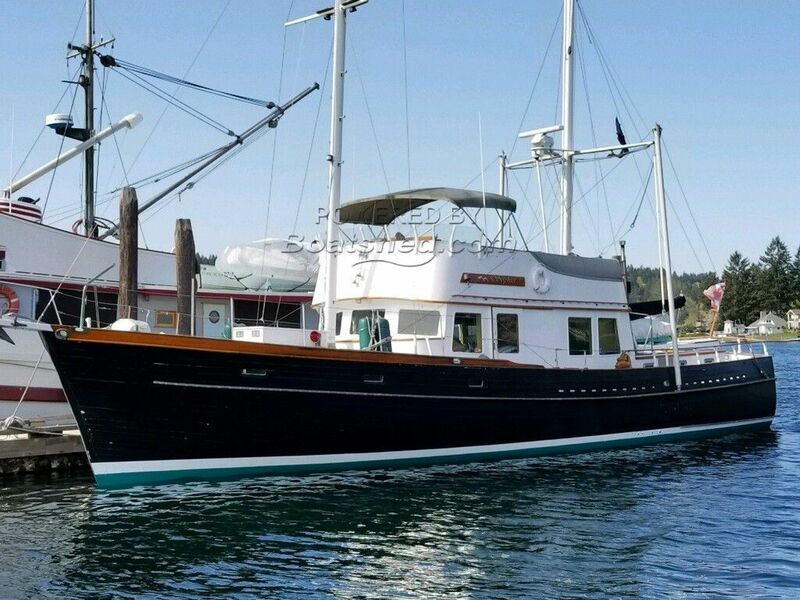 This Alden Motor Sailor-Trawler is attractive for a variety of uses; a comfortable liveaboard, an uninspected charter vessel for six or twelve persons, or as a long distance coastal adventurer. The upper bridge and deck can seat 12 persons. The three separate sleeping cabins, very large main saloon, the washer dryer combination and spacious galley certainly contribute to making a comfortable traveler for large groups. This Alden 57 Trawler With Ketch Rig has been personally photographed and viewed by Dave Carleson of Boatshed Seattle. Click here for contact details.